One billion people will die from tobacco-related causes by the end of the century if current consumption trends continue, according to a global report released by the World Health Organization (WHO). At a press conference held in midtown Manhattan, New York City Mayor Michael Bloomberg, whose charitable organization, Bloomberg Philanthropies, contributed $2 million to conduct the study, joined top WHO officials to present the findings. Among the litany of sobering statistics: 5.4 million people die each year - one every six seconds - from lung cancer, heart disease or other illness directly linked to tobacco use. Smoking killed 100 million people in the 20th century, and the yearly death toll could pass 8 million as soon as 2030 - 80% of those deaths will be in the developing world, where tobacco use is growing most rapidly. "We're on a collision course," - said Dr. Douglas Bettcher, director of WHO's Tobacco Free Initiative. The 369-page WHO Report on the Global Tobacco Epidemic, 2008, bound like a high school yearbook and bundled with a "cigarette pack" of colored markers, called on governments to adhere to six tobacco control policies it calls MPOWER: monitor tobacco use; protect people from secondhand smoke; offer help to people who want to quit; warn about the risks of smoking; enforce bans on cigarette advertising; and raise tobacco taxes. The report also breaks down tobacco consumption and prevention efforts country by country. To date, it is the most comprehensive study of its kind at a global level, said WHO Director-General Dr. Margaret Chan. The collected data should equip countries around the world to begin implementing anti-tobacco policies, Chan says, including smoking bans, aggressive anti-tobacco campaigns and massive tobacco tax hikes. According to the report, nearly two thirds of the world's smokers live in 10 countries - China, India, Japan, Indonesia, Bangladesh, the U.S., Brazil, Germany, Russia, and Turkey. China alone accounts for nearly 30% of all smokers worldwide. Currently, only 5% of the world's population lives in countries - predominately in Western Europe - that have any antismoking policies in place. "These are straightforward and common sense measures within the reach of every country, regardless of income level," - said Chan. According to the study, the most effective tactic globally has been simply to raise prices. Lower income people smoke significantly more than the wealthy, and spend a much higher proportion of their income on tobacco - 20% of the most impoverished households in Mexico spend as much as 11% of their household income on tobacco - mostly due to the tobacco industry's objective to get people addicted to nicotine, according to the study. Another vulnerable group: women. Though women still smoke at just one quarter the rate of men, tobacco advertisers are increasingly targeting this largely untapped market. Among adolescents in European Union member nations, girls may now be even more likely to smoke than boys. Globally, Chan said, "the rise of tobacco use among girls and young women is among the most ominous trends." As with virtually all public-health problems, a major hurdle to reducing smoking, the study said, is lack of public education. People are not fully aware of the hazards of smoking, and it's a weakness that the tobacco industry is quick to exploit, Bettcher said. Asked whether he would back a federal ban on smoking in the workplace or public spaces, Bloomberg said he would, but added, "I don't think the federal government should prohibit the manufacture or sale of cigarettes," but that combatting tobacco should mean diminishing the demand. Once a smoker himself, Bloomberg said he was able to quit only when he truly understood the consequences. "As I became more mature and started thinking, 'Do I want to live or not?' it was an easy decision." 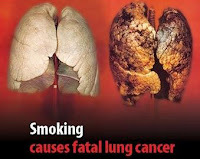 For those who want to smoke, however, he feels it should be their right, so long as they aren't harming others. "I happen to agree with those who think you have a right to kill yourself," he said.